1. Fry corn in 1 tblsp butter. 2. Add the remaining kofta ingredients except cornflour and cheese. 3. When the mixture turns completely dry, add cornflour and cheese. 4. 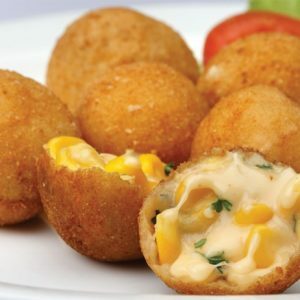 Form the mixture into small balls or koftas and deep fry the balls to a golden colour. 5. Roast coconut, groundnuts, chillies and til and grind to a paste. 6. Heat 4 tblsp of ghee, add the whole spices. 7. Then add onion, ginger and garlic and fry till soft. 8. Add coconut paste and all the spices and tomatoes and fry. 9. When the oil comes out, put in 2 cups of water. 10. Bring to a boil, then reduce heat and cook for 5 minutes. 11. Now pour the mixture over the koftas and garnish with coriander leaves. Feel free to comment or share your thoughts on this Corn Kofta Curry Recipe from Awesome Cuisine.